Filigree Butterfly Brooch Pin Handmade in Sterling Silver, "Catacos Butterfly"
Of delicate beauty and solid presence, this butterfly brooch pin certainly garners admiration. Giuliana Valz-Gen crafts the brooch by hand mastering the filigree techniques developed in Catacos. 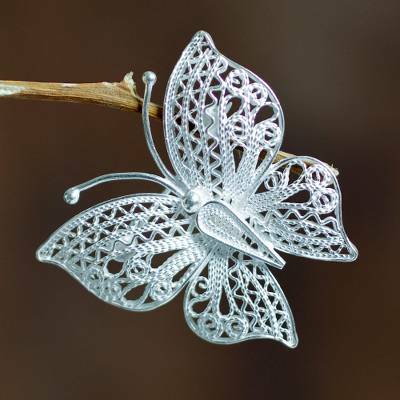 Working with fine threads of sterling silver, she creates different filigree patterns on the butterfly's wings and body. You can find sterling silver filigree brooch pin 'Catacos Butterfly' by Giuliana Valz-Gen in jewelry categories such as Animal Themed Brooches, No Stone Brooches, Silver Brooches, Sterling Silver Brooches and Filigree Brooches. Enjoy exploring these sections for other Novica treasures.